The Stars and IceHogs saw a three goal lead evaporate in a game between the two for the third time this season. This time, it was Texas on the losing end. After going up 4-1 in the first period, the Stars would not score another goal, losing 5-4 in an eleven round shootout. "We had a great start and capitalized on the power play," said Francis Wathier, who had his first goal of the season. "But the second and third period [effort] was not what our team stands for." Coach Desjardins agreed on the effort, "They have a pretty talented team and we had trouble holding them in the corners." 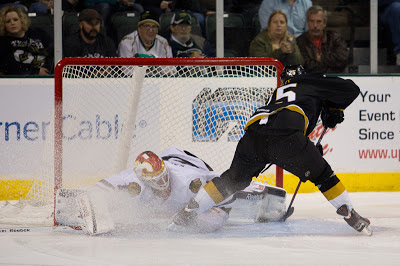 Cristopher Nilstorp ceded three bad goals in the second and third and gave way to Jack Campbell, who stopped eight in regulation and OT and nine of eleven in the shootout, but ultimately took the loss. Wathier added, "We have to get better, but it's not a panic button." Toby Petersen opened the scoring for the Stars just 71 seconds into the contest. The game's first shot found twine as Petersen went shot all the way on a semi-breakaway. Justin Dowling and Alex Chiasson picked up assists on the play. Only eleven seconds later, Brad Mills found himself in the box off a boarding call. The Stars struck again as Matt Fraser teed one up from the right wing circle off the Morin pass and tallied his 11th power play goal of the season and 22nd overall. Terry Broadhurst would get one back in the fourth minute as a blown defensive assignment left him all alone in front of Cristopher Nilstorp. He tapped in the David Gilbert shot to cut the lead to 2-1 Texas. Francis Wathier picked up his first of the year just past the halfway point of the period, beating Karlsson five-hole. Austin Fyten tallied his first AHL point with a nice pass to find Wathier open just above the hashes, and Carl Sneep had his first point as a Star on the secondary assist. "It felt phenomenal," said Wathier of his first goal of the year. "It was probably the only positive out of this game [for me]." The period ended on the power play as Dylan Olsen took a major for boarding Travis Morin. It was Morin's first game back from injury. Texas went to work on the man-advantage. Colton Sceviour picked up his 12th of the year in tight on a cram play. Morin and Fraser each picked up their second points of the night on the play. In all, Texas spent 9:05 of the first period on the power play and outshot the IceHogs 17-8. The Stars capitulated in the second period, allowing two Rockford power play goals. The first came off a missed pass by Nilstorp behind the net and the second as Nilstorp was just a bit too deep in his net and was beat by a blistering slap shot from the right wing boards. Rockford outshot the Stars 12-8 with Texas affording them four power play opportunities in the period. "It was a flip-flop from the second period," said Wathier. "They had chances on turnovers and oddman rushes. We took bad penalties but we knew the ref was going to even that out. You can't take that many penalties." Early in the third period, Cristopher Nilstorp just flat missed a clean point shot from Joe Lavin to tie things at four all. Jack Campbell came in to relieve him. "That's just rust from not playing," said Desjardins. "He's a good goaltender but for whatever reason he didn't have one of his better games." The Stars seemed to be forcing the play in the third period, and Rockford kept the pressure on. Errant passes and incomplete breakouts came back down the Stars' throat. Campbell kept them in the game and didn't deserve to take the loss. The Stars got a shootout goal from Justin Dowling but Jimmy Hayes would tie it up in the fifth round. Kenndal McArdle would beat Campbell in the eleventh round for the win. Texas maintains its hold on first place in the West. Charlotte is idle until Saturday, just like the Stars. Texas will hit the road to play back-to-back in Hamilton and Toronto this weekend. Matt Fraser extended his point streak to a club record eleven games with a goal and an assist. He superceded his own record of ten games, set last season in December. Nilstorp really looked like he needed some practice time to get rid of the rust from the stint on IR before being asked to start. Expected to see Campbell tonight, and then Nilstorp Saturday in Hamilton. The rust was evident. He flat missed the tying goal from the point. His angle was all wrong on the 4-3 goal as well. A goalie with his size should not have allowed that back post to be open off that shot. By the way, you linked the wrong gamesheet on your original posting. That was a really deep shootout. Any idea who would have been up next? Probably Fortunus then (maybe) Fyten. After that, it's all pretty equal. Justin Dowling had 3 GW goals in his first 8 games with the Stars (tied for the team lead for the entire season) and was the only one to score in the shootout tonight. Definition of a good pick-up. yeah willie needs to Rest Nilstorp it is Obvious he is not 100% play ready, if we want to keep ahead of Charlotte we need a fresh goalie like Campbell.he was clearly out of position for two of those allowed goals last night.